Our current President has defined his core economic tenets on the assertion of fairness, or to be more accurate, the unfairness of our economic system. Equality of outcome rather than equality of opportunity is the root principle. A forced re-distribution of wealth will act as an equalizer for the past sins of Capitalism. The administration, the Congressional majority, and an agreeable media are systematically dismantling the free-market mechanisms and installing a centrally regulated, command economy all for the sake of fairness. Evidence over the last fifteen months is overwhelming: Government takeovers of major industries and individual companies, massive ramp-up of government regulations on industry, tax changes to force re-distribution of wealth, and lectures on behavior by our Grand Arbiter of Fairness, the President. The consequences on all 330 million Americans are enormous. But where is the clear, unemotional evidence of either how bad it was under capitalism or how many more people will benefit under the new system? What is the alternative system? Where is it working today? All we have seen are a string of anecdotes and a parade of victims. Wall street bonuses are bad, out-of-work people are victims, millionaires don’t deserve their wealth, change will make it better. Facts are rarely useful in debates with ideologues and religious zealots. Yet we cannot allow partisans to make unchallenged, generalized claims about the free-market system with such consequential implications. Using comparative data over the long-term, we can find objective conclusions on the comparison of free-market capitalism to more regulated economies. The last twenty-five years, virtually a generational view on economies, gives us a broad perspective of market performance during a relatively stable period. Let’s compare countries side-by-side, answer claims of economic unfairness with facts, and decide which economy we would like for our children. Data source: The Organisation of Economic Co-operation and Development (OECD) is a 30 country member group1 that provides unbiased, consistent economic data comparisons. 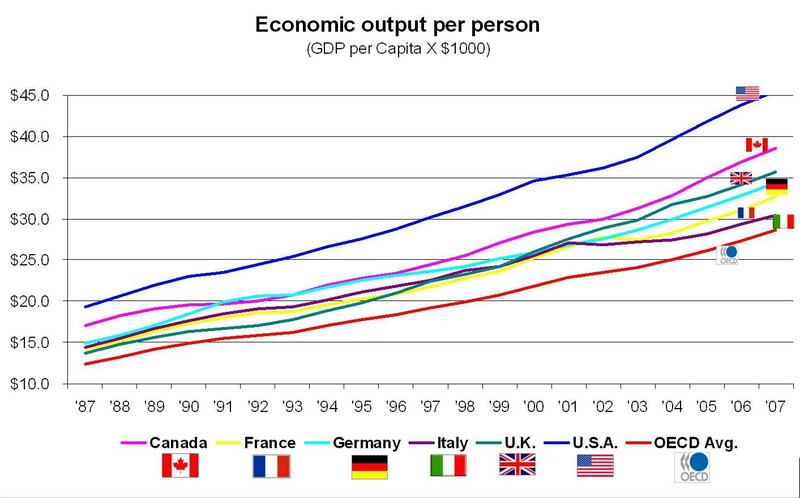 Please note: For purposes of balance, comparisons are made of the U.S. economy compared to the top five western democratic economies, and the OECD average where data was available. 1987 through 2007 were selected only for completeness of data. Our economy has been weak for the last decade. Our problems have only been covered up by deficit spending and cheap credit. 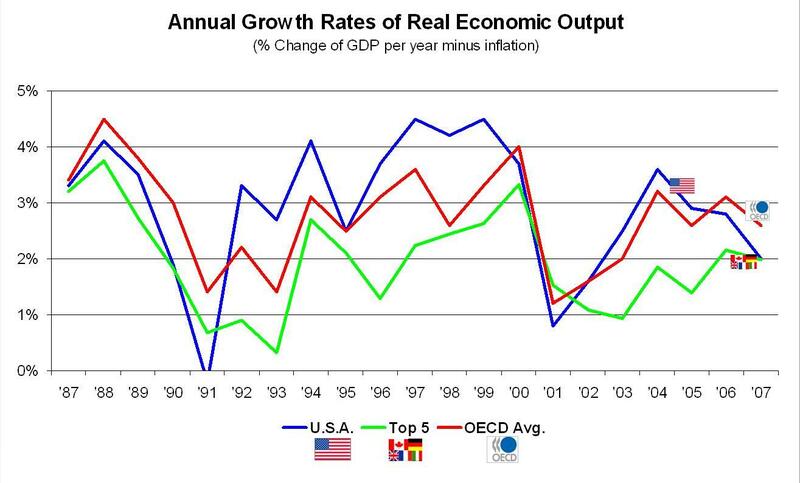 The U.S. has out-performed all economies over a 20 year period, out producing goods and services, worker for worker. In terms of annual growth rates, our free-market system has more extreme highs and lows but has climbed out of recessions faster and provided more sustained growth periods. Rising tides lift all boats. Economic growth of goods and services means more jobs, higher wages, and more opportunities for all citizens. Yes, but the U.S. uses more than its fair share of resources. Our rampant consumerism is unsustainable. It is not a zero-sum game. 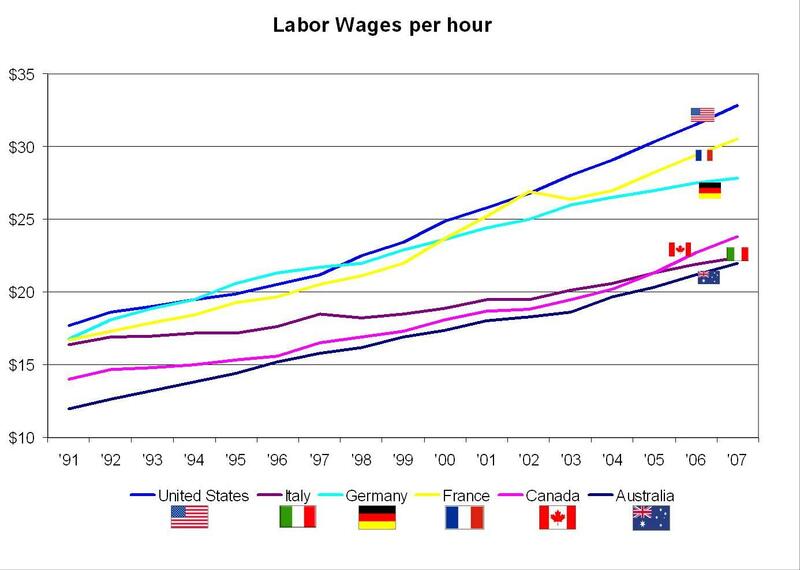 If the U.S. produces less, Canada and Indonesia do not automatically get more. More importantly, our economic growth benefits workers across the world. Our economic engine creates opportunities for progress for individuals in poor countries and developed countries, alike. We continue to ship jobs over seas to China. The economy is not producing new jobs. There are no new opportunities for young people coming out of school. The government needs to create jobs opportunities, private industry isn’t getting it done. 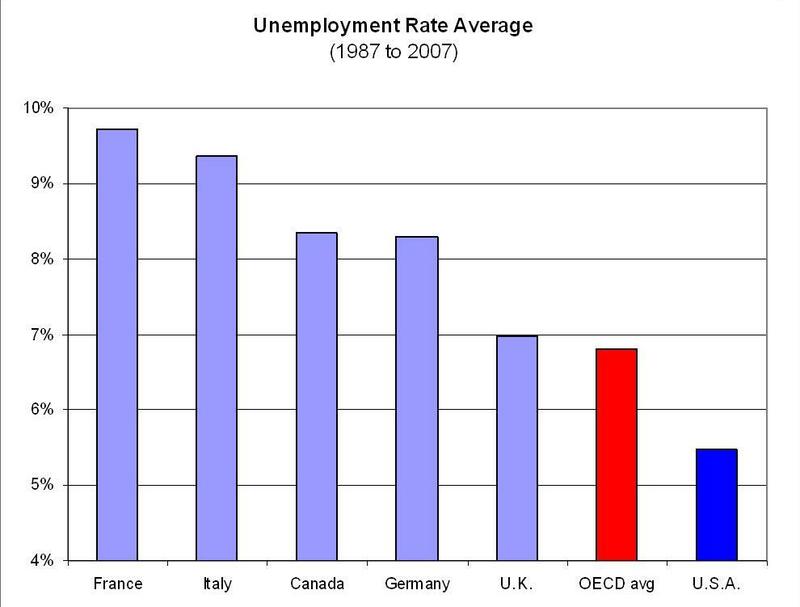 For a generation, we have had the lowest unemployment rates of any developed country other than Japan. (Note, every 1% of U.S. unemployment equals approximately 1.5 million workers.) Free-market capitalism is more dynamic. Industries and job opportunities change more frequently forcing people to change, but the jobs are there. 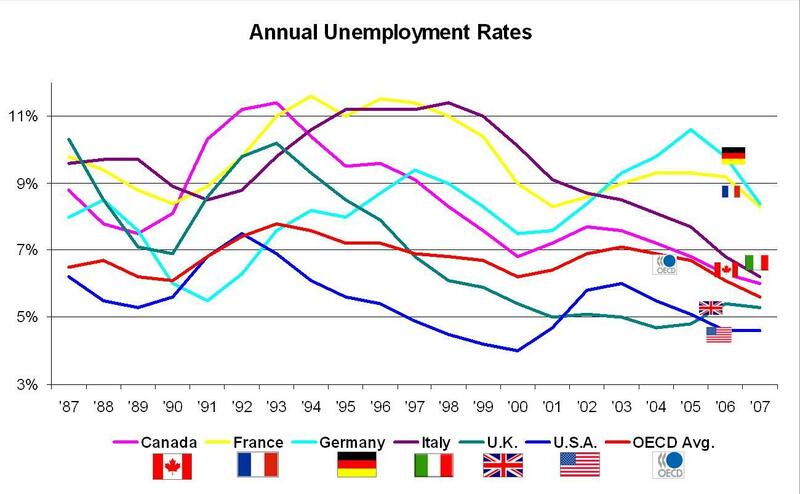 France and Germany have been experiencing our current “high unemployment” levels since 2003. Germany has approximately 2.5 million permanently unemployed workers on the federal “dole”, not counted in the numbers. That is out of a total population of 82 million people. Our unemployment may be lower than other countries, but the quality of jobs created is decreasing, wages are lower, factory jobs are being replaced with fast food jobs. We are failing to help workers train and adapt to new jobs, they are falling behind other countries. Corporations retain larger profits while the workers lose salaries and benefits. We have maintained the highest hourly wage rates, and it continues to increase not decrease. 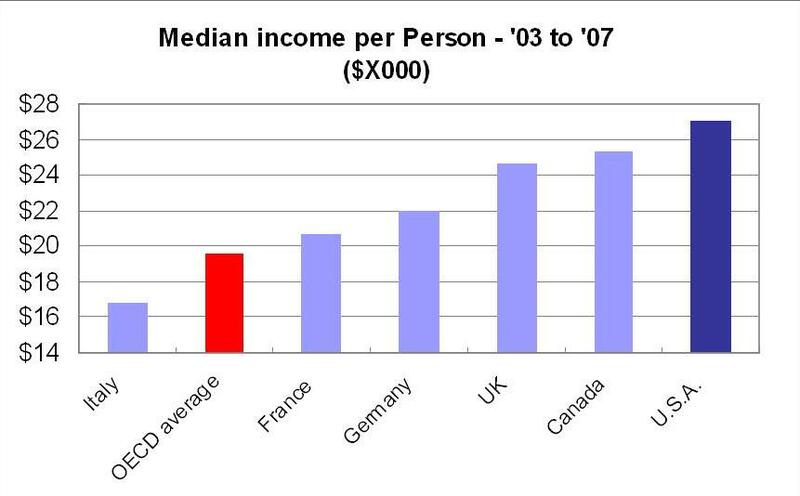 Over most of the last decade, the U.S. has maintained the highest median incomes in the developed world. Again, job types are constantly changing but overall the wages are increasing. Our workers are also very productive compared to other developed countries averaging 2.2% labor productivity growth per year over the last twenty years and out-growing other developed western countries, 8 out of the last 10 years. The tax structure must change. The government must raise taxes to provide the programs for job creation and support those that are out of work and in need of benefits. 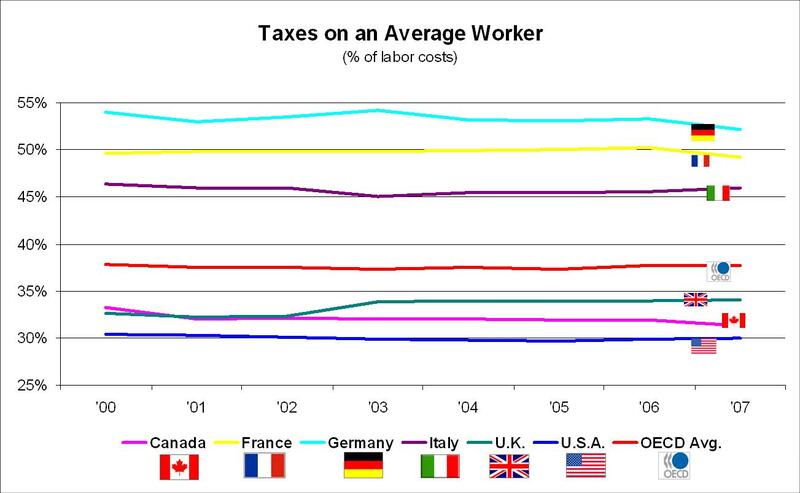 Taxes simply take money out of the market, consuming economic value. Governments taking money away from the wage earner hurts everyone in the economic food chain and reduces the worker’s lifestyle. Could there be a clearer connection between higher growth, growing wages, lower unemployment, and better productivity vs. punishing tax rates than the results of the last twenty years? Virtually every individual and family experiences economic hardships over a lifetime – job losses, companies going out of business, bad luck, loss of a primary wage earner, bad financial decisions, starting over. Every family experiences such bad times. But that’s not symptomatic of the economic system, that’s called life. There is no perfect system. People get left behind. Many will earn more than you will. We have been spoiled by a generation of economic success. Prosperity allows us the intellectual leisure to imagine a perfect world where no-one is stressed and everyone succeeds. Our government is currently run by self-proclaimed intellectuals who foolishly believe they can actively manage the incredible complexities of our economic system. While they experiment, all citizens pay the price of lost opportunity and individual pain. Yet, it is indisputable that sustained economic growth and prosperity benefits all citizens. Free-market capitalism has proven to help the most people achieve personal fulfillment, creates the most opportunities, hires the most people, and provides the economic engine for life, liberty, and the pursuit of happiness. 1 http://www.oecd.org The 30 member countries of OECD are: Australia, Austria, Belgium, Canada, Czech Republic, Denmark, Finland, France, Germany, Greece, Hungary, Iceland, Ireland, Italy, Japan, Korea, Luxembourg, Mexico, the Netherlands, New Zealand, Norway, Poland, Portugal, Slovak Republic, Spain, Sweden, Switzerland, Turkey, United Kingdom, United States. This entry was crafted by, David Nathaniel, a friend of ‘dadofmultiples’. David holds a masters degree in Business from The Ohio State University. He has spent the last twenty years in international business.